If you have mastered the art of grilling the perfect steak and are ready for a new challenge, using cedar planks for grilling is an awesome way to expand the foods you can easily prepare with your grill. Grilling with cedar planks is simple, but there are a few preparation steps you will need to take each time you use your planks. Before using your cedar planks, you will need to carefully rinse the wood to remove any dust. Do not use any type of soap as this may add an unpleasant flavor to your wood and be hard to remove. Simply use plain warm water to rinse your cedar planks. Choose a container large enough for your cedar planks to fit into and be completely submerged in water. If your sink is big, you can even use the sink. A large plastic tote or a five gallon bucket are both good options for soaking your cedar planks, also. Make sure to choose a container that does not have any scent in it to be sure that smell does not soak into your planks. To soak your cedar planks, put them in the container with plenty of water to cover them. You may need to put some type of weight on the planks to be sure they do not float to the top. Remember to choose something as a weight that is clean and has no scent. It is amazing how quickly other smells can soak into wood. Leave the cedar planks submerged for 1 to 4 hours. 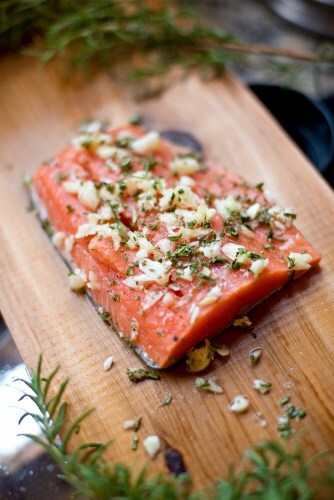 If you want to bring out the cedar flavor from the plank, add a tablespoon of salt to the water as they soak. Soaking your cedar planks before grilling with them prevents them from burning while you are using them and it also increases the moisture in the food you will be preparing. Once they become comfortable with using cedar planks for grilling, many people begin to experiment with other liquids to add to the water they are soaking their cedar planks in. Each liquid will bring a different flavor to the meat or vegetables you are grilling. One of the most popular to use is apple cider vinegar. Other people choose white wine vinegar. Almost any juice or flavored liquid can be added to the water to soak cedar planks in. Some recipes will offer suggestions on alternatives that will enhance the flavor of the recipe. Citrus and berry juices are delicious options, as are different flavors of wine. Experiment with different liquids to find your favorite. Remember that you need to soak your cedar planks every time you use them. They cannot maintain moisture for long periods of time. If you are worried you may forget to soak them the day you will be using them, put the cedar planks in the water to soak the night before.